Nick's Nature Notes: A bat fan-attic! One of the early delights of moving to Devon this summer was watching bats flying around our barn and those of our neighbours. I wondered if any roosted in our building and if so, where had they found to reside. As far as I was concerned they were very welcome, having held a lifelong fascination in these curious creatures. Before we moved into our new home our surveyor had provided a very satisfactory report, with only a few minor defects noted. One of these was a seemingly faulty extract fan in the downstairs toilet. This soon became apparent when I tested it after moving in – however I then became distracted with general moving and settling into our new home - anyway the doors were open much of the time and so ventilation not a key issue. However the weather acutely reminded us this week that it is autumn, requiring us to make more use of mechanical ventilation. This then tied in yesterday with an unpleasant surprise in the downstairs toilet! A steady drip seemed to be coming from the dodgy ventilation unit. Initially I wondered if it was excessive condensation in the ventilation system caused by the sudden drop in temperature. Shining a torch up through the plastic protective grill I noticed a furry looking creature and guessed it might be a trapped young bird. 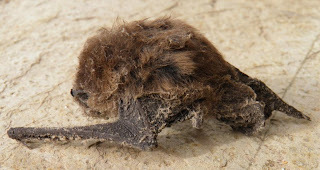 However when I removed the grill out fell a desiccated bat (see image). I can only assume that the bat (I’m making a fairly safe guess at the Common Pipistrelle, Pipistrellus pipistrellus ), entered into our roof space/attic and got lost and then stuck down the ventilation ducting. (1) Why the extract fan did not work properly? (2) Do bats live in my house? Oh, and in case you were wondering, the drip was nothing to do with the ventilation – a leak from a tap in the upstairs bathroom was tracking down the side of the ventilation tubing. Both domestic problems are now resolved, but unfortunately no happy ending for the bat.